Original Portuguese article published in Observatório de Favelas. 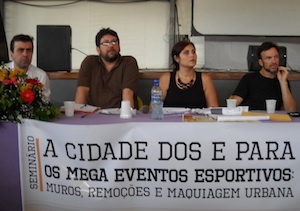 On Friday September 30th, the NGO REDES de Desenvolvimento da Maré (Development Networks for Maré), in partnership with ActionAid and Observatório de Favelas (Favelas Observatory), set up the seminar “The city of and for mega sporting events: Walls, evictions and urban make-up.” The event brought together, at the Lona Cultural Herbert Vianna, in the Maré Favela, 250 people, a mix of residents, non-residents, thinkers and political activists, all interested in the debate about the current conjuncture of the city pre-World Cup and Olympics. The participants discussed the potential and probable impacts that the huge sporting events of 2014 and 2016 will bring. On the agenda were the consequences for the city and for the areas most negatively affected by the arrival of The World Cup in 2014 and The Olympics in 2016: the favelas. 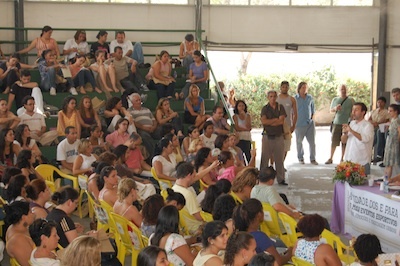 Subjects such as the so-called maquiagem da favela (superficial cleaning-up of the favela for the purpose of appearance only), the right to the city, state of exception and the methods and ways for growing participation and social mobilization, were discussed at the meeting. The first issue to be discussed was that of walls built a little over a year ago, along the Red and Yellow Motorways (just next to Maré). The results of a study carried out by the Centre of Studies and Research of Favelas and Popular Spaces (NEPEF) called “The Walls of the Invisible” were presented during the event. The study showed that 73% of Maré’s residents think the walls were built to hide the favela and separate it from the city. Other results emphasised that, in the opinion of residents, the building of walls is part of a process of maquiagem das favelas for the arrival of tourists, foreign business groups and various sports committees. The study also detected that from the perspective of favela residents and above all community leaders, the main problem is the lack of communication between the authorities and the areas which will be affected the most by the changes the city is experiencing. “The human rights violations result from a lack of dialogue. In all the City’s actions we’ve experienced a total negation by the State of the basic right of residents to see the project plans for their respective areas. In general, negotiations with residents are carried out by companies employed to carry out the constructions works,” says Marcelo de Medeiros one of the coordinators of the study. The first month’s theme was “Walls: make-up on the city and fencing the communities.” In addition to Medeiros, Brian Mier (ActionAid-Brasil), Jorge Barbosa and Jailson de Souza (Geographer from the Federal University of Niterói and founder of the Favela Observatory) participated. The debators discussed with the audience strategies to intensify dialogue with the authorities, so that together a social legacy of the forthcoming competitions could be attained. “Our challenge is to have the favelas more widely recognized as fixed and formal spaces of the city. And with the intention of overcoming this we are creating conceptual and political propositions, trying to conquer the hegemony. The State recently declared that 5 communities within Maré are formal neighbourhoods, completely ignoring the fact that Maré in itself has been a neighbourhood for a long time. There is, within this decision a wrong assumption, whereby the favela is not considered part of the city. According to this idea, the solution would then be that the favela ceased to exist, transforming it into a neighbourhood. It is necessary to break this notion: favela is part of the city!” exclaimed the coordinator of the Favela Observatory, Jailson de Souza, whose next comment was that the government’s current work is to build a city that has nothing to do with promoting encounter and debate, but rather to tending to the interests of the market. Jorge Barbosa called attention to the risks of simply reacting to the State’s actions. The geographer, professor and coordinator of the Favela Observatory stressed the importance of building consistent proposals capable of surpassing impasses and precisely defining the city we want for ourselves. “It’s necessary that we have a political agenda in which dialogue is mandated. Not just for the favela, but the whole city. It is because of this that it’s necessary to supercede the idea that favelas need to be integrated into the city. It’s the city that needs to be integrated with the favela – residents must be seen as subjects with fundamental rights, as all of the city’s inhabitants. But not just fundamental, but also extraordinary rights, like the right to happiness, festivity, even vanity,” he said. Brian Mier, Coordinator of ActionAid-Brazil’s Right to the City program, cited some of the difficulties that exist to speak to the authorities at the moment. “The government suffers true blackmail from FIFA. Any proposal that is not in line with FIFA’s interests leads them to threaten cancellation of the World Cup. Therefore, to confront the government is to confront FIFA and the media,” he stated. Mier’s evaluation came at exactly the moment when FIFA asked the Brazilian government to temporarily suspend the rights of the elderly, consumers and fans during the 2014 World Cup. This because FIFA does not agree with the right to half-price tickets in the stadiums where the football games will be happening. In the discussion about the relationship between the right to the city, the state of exception and mega-events, one of the recurring questions was that of the wide consent by the population with relation to the occurrence of these two huge sporting events. For Guilherme Soninho, from the State, Labor, Territory and Nature Laboratory (ETTERN) of the Urban and Regional Research and Planning Institute of the Federal University of Rio (IPPUR-UFRJ), at this moment a coalition of market interests is using diverse strategies to reach its objectives, none of which have to do with improving the social welfare of Rio’s citizens. “These sporting mega-events in Rio are like business ventures. The people chosen to manage the contracts are directos of banks who don’t have anything to do with the issue at hand, that is sport. Corrupt means and consent have brought this on. On the one hand they count on approval of the majority of the population while, on the other, they use coercion over the minority who try to resist . And that’s how it works,” denounces Soninho. State Deputy Marcelo Freixo, also present at the event, reminded participants of the complexity of this theme, pointing out some of the consequences of the ideological discourse that omits the negative impacts of large sporting events. “Debate is fundamental for our city. But it is necessary we correctly understand the situation. If there were a plebiscite regarding whether to realize the World Cup or Olympics, the “yes” vote would win by a landslide. And this is due to a sense of belonging. Today, for example, young people without means don’t go to Rock in Rio. Yet they buy a t-shirt that says ‘I went.’ To show to others that (s)he was a part of a historic event, even if it’s a lie, that’s all that matters,” explained Marcelo. Luiz Mário, of the Popular Budgetary Forum (Fórum Popular do Orçamento) called attention to the absence of proposals by the Games’ organizers with regard to their social legacy. Mário remembered the Pan-American Games, which left no positive inheritance to the city. “All this debate about what is happening and the negative impacts that the events may bring, we lived already four years ago, for the Pan-American Games in 2007. The only difference is that then, at least there was discussion of the benefits of the Games for the population and a social legacy. Today, this discourse is very obscure,” he alerted. This article was written by Bruno Rodrigues, Thiago Ansel, and published on October 19, 2011.